Candy anyone? 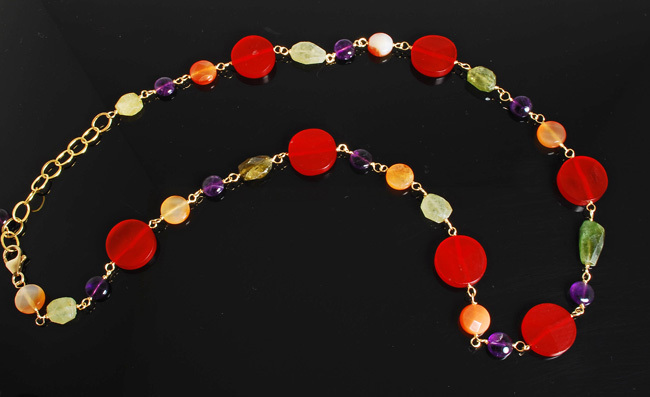 This delectable necklace will make your mouth water and your clothes pop with color! Faceted red buffalo horn, faceted grosular green garnets, faceted carnelian and shiny amethyst buttons sparkle on 14K GF links. Extender chain lets you wear it anywhere from 18″ to 22″. Incredibly lightweight! Also available in brown/gold/black tones with faceted amber buffalo horn, onyx, and carnelian (not shown).